All lunch specials are served with your choice of soup or house salad, along with hot rolls and garlic butter. Cannot be split, shared, or used with any other discount, offer, coupon or promotion. Dine In Only. Happy Apps available only with purchase of Happy Hour Drink Specials. Limit 2 Happy Apps per person. Receive One Free Kid’s Meal per Adult Entrée Purchased. Includes fountain drink or iced tea and vanilla ice cream wedge. For Kids 10 and under ordering any meal from the kid’s Menu only. Does not include additions or substitutions to meals. Not valid with any other discount, offer, coupon or promotion. Dine In Only. Catch yourself in a bind or out of time? Need a great card to go with your gift certificate? Ask management for details regarding pricing of gift cards. 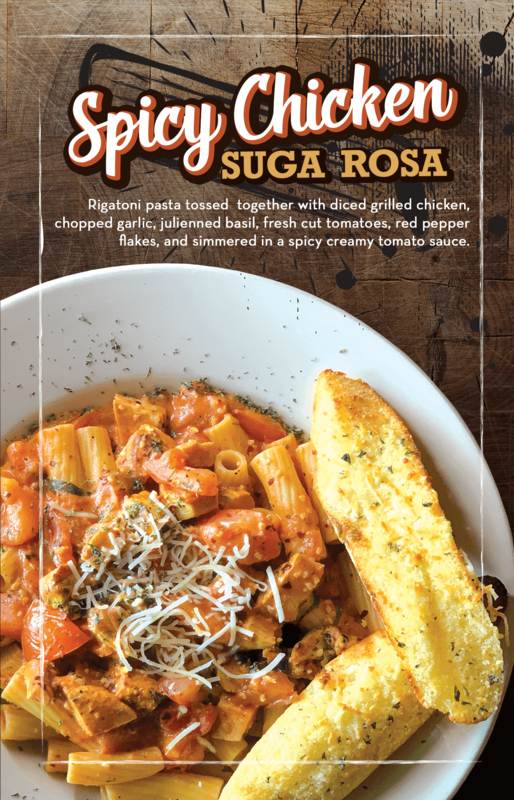 Rigatoni pasta tossed together with diced grilled chicken, chopped garlic, julienned basil, fresh cut tomatoes, red pepper flakes, and simmered in a spicy creamy tomato sauce.